The Grace G-714 wood frame tonearm is made from the highest grade of selected Teak. The most advanced techniques have been employed in the design and manufacture of every detail. Features include the tapered design, uni-pivot support, oil damping, and a new type of tonearm/headshell connector. 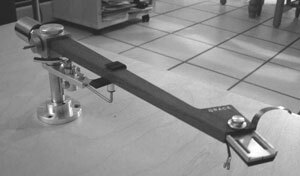 The dangers of warping and other problems have been eliminated through careful selection of materials and advanced drying techniques used in the manufacture of the G-714 wood frame tonearm. The arm is protected by an oil finish. The uni-pivot damping system has received wide critical acclaim from audio experts. The hum heard when most headshells are removed has been eliminated by means of a specially developed self shorting connector. The G714 socket contacts are gold plated for optimum contact while headshell contacts are plated with rhodium which has three times the durability of gold. Special hard damping material is used at all points to achieve an optimum damping factor. By the use of a unique lead line design, the adverse affects of tonearm rotation are prevented. Tracking force adjustment is of the direct reading type, one full turn equals a 3g change and 0.1g increments allow precise adjustment. Grace G-714 / G714 owners manual, service manuals and schematics are for reference only and the Vinyl Engine bears no responsibility for errors or other inaccuracies. The PDF files are provided under strict licence. Reproduction without prior permission or for financial gain is strictly prohibited. This website is not affiliated with or sponsored by Grace.